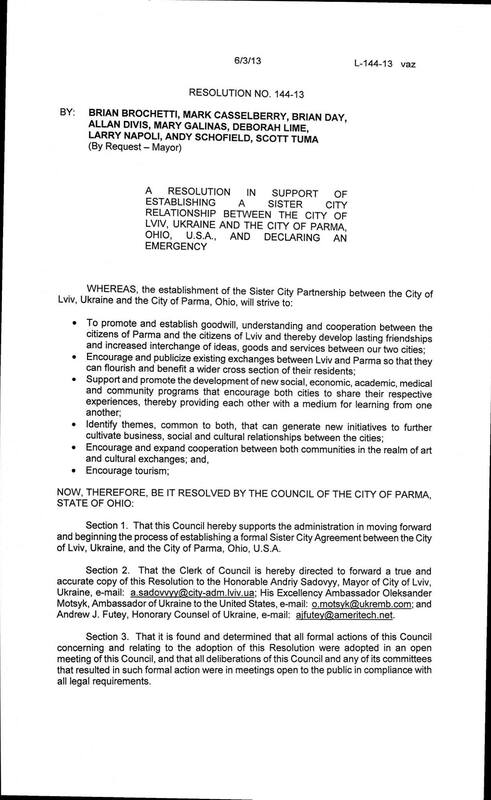 On Monday, [June 10, 2013], about 20 representatives of the Ukrainian community urged City Council to make Parma a sister city with Lviv, Ukraine. A proposed resolution would help make it happen. 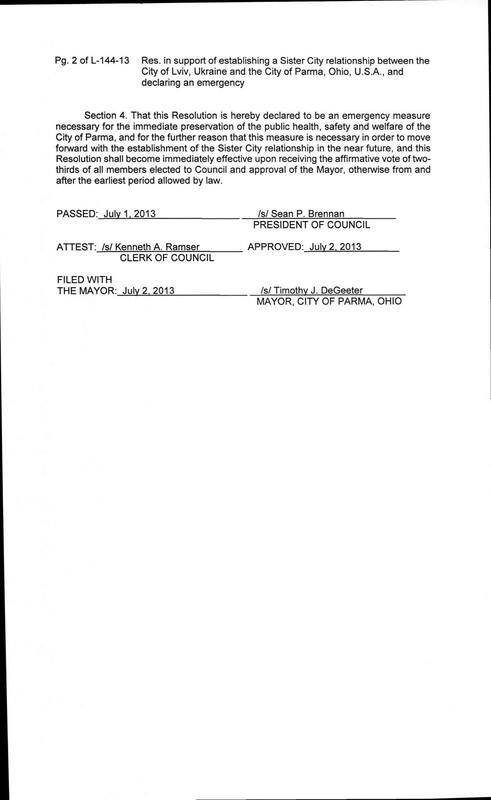 Council’s Governmental Operations Committee referred the resolution to council Monday. It was Mayor Tim DeGeeter, during his February state-of-the-city address, who first publicly proposed cultivating a sister-city relationship with Lviv. 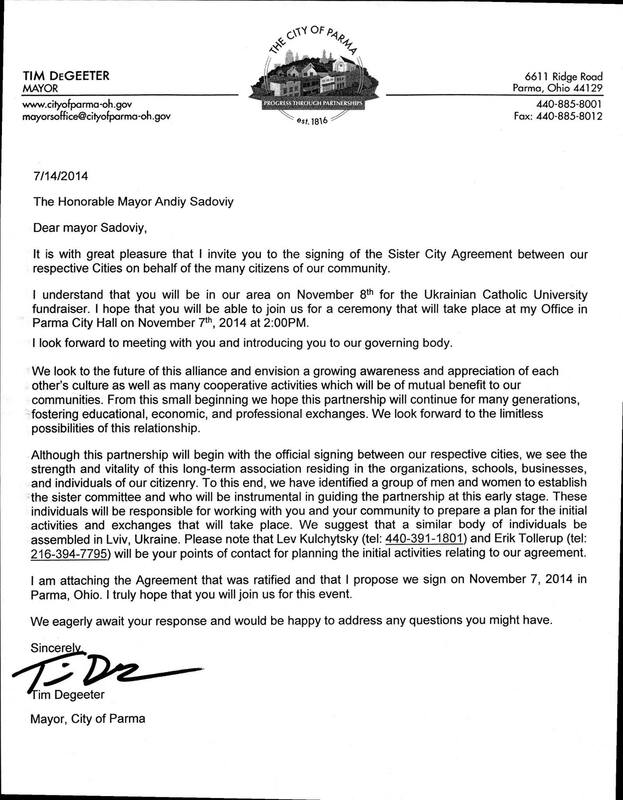 At the time, DeGeeter said he sent a letter about the proposed relationship to Lviv’s mayor. 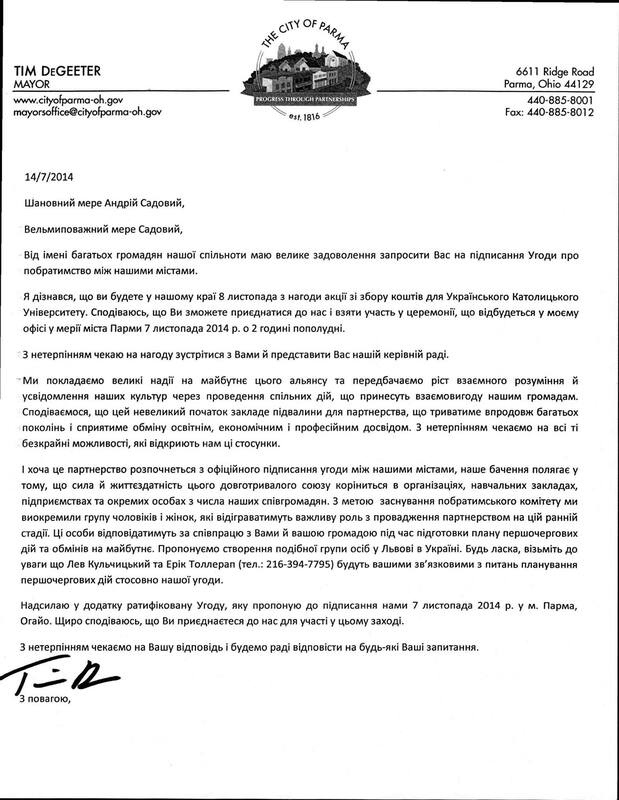 On Monday, DeGeeter said the city received a “favorable response” from the mayor of Lviv. DeGeeter said the administration of President Dwight D. Eisenhower started the U.S. sister-city program in the 1950s. The idea was to promote good international relations. DeGeeter said it makes sense for Parma, as Ohio’s seventh-largest city, to have a sister city. Parma’s Ukrainian Village contains Ukrainian churches, cathedrals and businesses, DeGeeter said. Meanwhile, General Motors, which is Parma’s largest employer, has a small presence in Ukraine, DeGeeter said. DeGeeter said Cuyahoga Community College in Parma might have an “educational exchange” with Lviv, DeGeeter said. “This is a great thing not only for Parma but regionally, for Northeast Ohio,” DeGeeter said. Andriy Futey, honorary counsel of Ukraine for Ohio and Kentucky and the executive vice president of the Ukrainian Congress Committee of America, then spoke to the committee. Futey said Greater Cleveland is home to the sixth-largest Ukrainian-American community in the United States. He said the heart of that community is in Parma. Futey added that several Parma residents emigrated from Lviv. He said Lviv is also the name of a Ukrainian Village business. Lviv’s population is about 725,000, Futey said, and the city is known as the capital of western Ukraine. He said Lviv is one of Ukraine’s cultural centers. Futey said he has met with Lviv Mayor Andriy Sadovyy and Oleksander Motsyk, ambassador of Ukraine in Washington, D.C.
“They fully support our initiative and look forward to the formal designation and a productive exchange,” Futey said. “They agree that we can develop new social, economic, cultural, medical, educational, and government-to-government programs,” Futey said. Roman Fedkiw, chairman of the Ukrainian Village Committee in Parma, said Ukrainians have contributed significantly to Parma’s economy and quality of life. Fedkiw said that since Ukrainian Village was established in Parma in 2008, the Ukrainian committee has organized the village’s grand opening, annual parades and the opening of Ukrainian Heritage Park, among other activities. Fedkiw said that according to Sister Cities International, about 600 American cities have sister relationships with nearly 2,000 cities in 136 countries. “A sister-city partnership with the city of Lviv would allow for the exchange of both people and ideas,” Fedkiw said. “The exchange of people creates a positive impact on our economy — an inherent side effect of the tourism industry. Fedkiw said the exchange of ideas can benefit colleges, hospitals and businesses in both cities. Marta Liscynesky-Kelleher, vice president of the United Ukrainian Organization of Ohio, said about 20,000 Ukrainian-Americans live in Parma. Councilwoman Mary Buchholz-Galinas said she did not know that Parma is home to so many Ukrainian-Americans. Also appearing at Monday’s meeting were George Salo, owner of State Meats, and the Rev. John Nakonachny, pastor of St. Vladimir Ukrainian Orthodox Cathedral. Both the business and the church are in Ukrainian Village. DeGeeter said that after council approves the resolution, Parma and Lviv officials will meet and sign formal documents. “Then the real work begins,” DeGeeter said.